We are glad to announce that the project “Centralbaltic Job Ferry” (CB Job Ferry) has just published the 5th edition of its regular Newsletters. The most important events at the end of 2012 were participation of the CB Job Ferry project representative in the Annual Conference of the Association of European Border Regions (AEBR) organised in November, 2012, in Berlin, Germany, where the project was introduced to a broader public as well as to international experts in field of cross-border labour mobility. Also, the fourth project partners’ meeting and workshop were organised on November, in Turku, Finland.Besides,CB Job Ferry had a possibility to introduce broader audience with the project and its achievements during the 4th Latvian National Employment and Professional Development Fair “Darbs EXPO 2012” (Job Expo) in Riga in December, 2012. 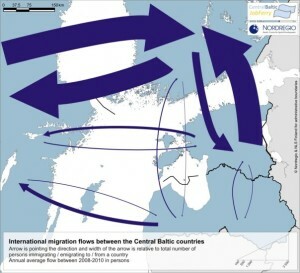 In addition to the abovementioned, in this Newsletter edition you can also read about the tools to facilitate cross-border labour mobility in the context of Action Plan of the European Union Strategy for the Baltic Sea Region as well as results of the labour mobility analysis in Estonia pointing out the main challenges for facilitating the cross-border labour mobility in the Baltic Sea Region. Dear Readers, we would like to inform you that on 19 March 2013 Final Conference of the “Centralbaltic Job Ferry” project will take place at the University of Latvia in Riga to present project results and opportunities offered by the new Internet platform www.cbjobferry.eu. You are kindly invited to participate at the Final Conference of the project where the recent trends of the labour market and labour mobility in the Central Baltic region and beyond will be discussed! For more information about the Final Conference, please see below the article “Conference on the Cross-border Labour Mobility in the Central Baltic region will take a Place in Riga (Latvia) on 19 March 2013”. Your prior registration for this event is required. Please see the Events’ Calendar at the end of this Newsletter. The CB Job Ferry project started on May, 2011, in the framework of the Central Baltic INTERREG IVA Programme 2007 – 2013. The project is implemented by international team which includes partners from Centre for European and Transition Studies at the University of Latvia, Nordic Centre for Spatial Development – Nordregio (Stockholm, Sweden), Turku University of Applied Science (Turku, Finland), and Institute of Baltic Studies (Tartu, Estonia). The University of Latvia is the Lead Partner in this project. The project aims at establishing the customer-oriented cross-border advice and information platform for job seekers, graduates looking for a job abroad, placement officers and regional employers. The project’s Newsletters regularly inform its readers about upcoming events and developments within the “Centralbaltic Job Ferry” project. In order to maintain close communication with all labour market players, we would also appreciate your contribution to the implementation of the project. Please, contact the project staff to contribute to the project by giving your comments and advices. Your contribution would help us to build as up-to-date and as relevant information platform as possible. We express our sincere gratitude to all the project supporters and experts that kindly shared their experiences and visions during the previous phases of the project. You can also follow us on Facebook – www.facebook.com/CentralBalticJobFerry. We hope to a continuation of fruitful collaboration also this year! If you have problems with viewing all the contents of this newsletter correctly,click here. The Central Baltic region is a home to around 10 million people. Cross-border labour market mobility in the region has enhanced more efficient matching of employees’ skills with employment opportunities. Although, it has aggravated the internal labour market situation in Estonia and Latvia, at the same time labour market mobility has also offered possibilities for individual employees and facilitated general up-skilling of their qualifications. In the upcoming years a labour shortage is expected in quite some sectors across the region. The “Centralbaltic Job Ferry” (CB Job Ferry) project is aiming at increasing the cross-border mobility in all countries of the region by mapping potentially demanded professions and providing detailed information for job seekers. The public Final Centralbaltic Job Ferry Conference on the cross-border labour market mobility in the Central Baltic region will take a place at the University of Latvia, Main Building (Raina Blvrd. 19, Small Hall) in Riga, Latvia on 19 March 2013 from 9:30 to 17:00. The Conference will focus on the recent trends of the labour market and labour mobility in the Central Baltic region and beyond, as well as on opportunities offered by the new internet platform www.cbjobferry.eu. The conference will present the main research outcomes of the project concerning labour mobility in the Central Baltic region. Also the CB Job Ferry web platform will be presented. The platform offers well structured, comparative information on the most demanded professions in the Central Baltic region as well as information on recognition of professional qualifications, working conditions, professional requirements, and potential employers. Among conference participants and invited speakers there will be guests from labour market institutions, especially those dealing with labour mobility issues as well as from universities, other education institutions, employers’ organisations, labour unions and employers. Also public and private placement officers and HR managers from the region and representatives from the cross-border regions of the EU, as well as from other organizations and projects dealing with cross-border labour mobility are most welcome to participate in the Final Conference of the project. (1) What are the main characteristics of the cross-border labour market mobility in the Central Baltic region and how can they influence the labour market situation in Estonia, Finland, Latvia and Sweden? (2) Building on the experience of other cross-border regions, organizations and projects in Europe. What are the possibilities for collaboration between different projects? (3)What are the existing experiences in recruiting cross-border job seekers, opportunities and drawbacks of cross-border labour mobility? (4) How can the web platform (www.cbjobferry.eu) support employers to find employees and employees to find employers as well as relevant education? What are stakeholder’s interests and how can they benefit from the CB Job Ferry platform? All interested parties are welcome to participate at the event. Participation is free of charge. The registration deadline is March 5th, 2013. If you want to register for the conference or to obtain more information regarding participation, please, contact Ms. Viktorija Stadnika ( viktorija.stadnika@lu.lv; tel. +371 26878539) or Ms. Denize Ponomarjova ( denize.ponomarjova@lu.lv; tel. +371 28241115). 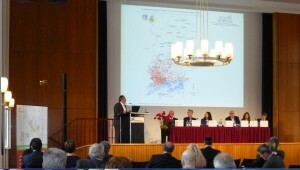 The Annual Conference of the Association of European Border Regions (AEBR) was organised on 8-9th of November 2012 in Berlin. The AEBR is an independent association of border regions in Europe dealing with cross-border cooperation issues, as well as theoretical and practical experiences related to cross-border cooperation. The Senior Researcher of the Nordregio Dr. Petri Kahila presented the main research results of the “Central Baltic Job Ferry” project at the AEBR Annual Conference. The theme of the Annual Conference targeted this time was the labour market mobility. The AEBR had an intention to underline the importance of labour market mobility as a part of the daily life of people. Generally, the problems related to different social security and tax regulations are especially challenging in border regions. They also face multifaceted and continuously changing administrative, social and economic conditions, in which border regions have to accommodate themselves. There are no standard solutions or alternatives available in this case, but individual circumstances in border regions require individual information and advice as well as exchange of experiences. The Annual Conference of AEBR offered a framework to discuss current challenges and problems with a number of invited experts from European border regions. Discussions during the Annual Conference emphasised the fact that a possibility to work or recruit personnel across the border will open new opportunities both for employees and for employers. It was mentioned that the labour shortage in particular sectors can be resolved through workers from neighbouring countries, if not permanently then at least temporarily. Cross-border labour market offers many additional opportunities, but the number of individuals commuting across the borders could be significantly higher than it is now. Also, the attention was paid to accession of reliable information on consequences of getting a job at the other side of the border. Several experts emphasised that there are numerous obstacles to cross-border mobility that have not been solved yet. For instance, job seekers simply fear that they would not have same rights as at home. National social security and taxation systems are not harmonious between countries. The European Union has furthered various initiatives in order to coordinate national social security systems. Director General of DG REGIO Walter Deffaa emphasised in his presentation that people living in one country and working in another might face daily legal, administrative or tax related obstacles. The question on how to implement European legal framework in practice is still not clear. Another problem is also that various administrative bodies are not located in border regions and, thereby, they are not aware of difficulties in these regions. The “CentralBaltic Job Ferry” project has identified similar obstacles hampering cross-border labour market mobility in the Central Baltic area. Especially there is a need to mobilise and create cross-border networks and partnerships to provide appropriate information to employees and employers. During the AEBR Annual Conference, it was indicated that this kind of information can hardly be offered in a systematised form through the Internet. It was also emphasised that there is an acute demand to advance individual accessibility to complex information on cross-border labour markets. In this context, the “CentralBaltic Job Ferry” project has succeeded to underline correct themes and to develop proper tool in facilitating and enhancing cross-border labour market mobility. Possibilities for improving the cross-border labour mobility have been discussed at the 4th Workshop of the “Centralbaltic Job Ferry” project in Turku, Finland on 27 November 2012. The Head of the Joint Technical Secretariat of the Central Baltic Interreg IVA Programme 2007-2013 Dr. Philipp Schwartz addressed participants of this event emphasizing the importance of cross-border labour mobility issues. Ms. Kirsi-MariaNikander from the Centre for Economic Development, Transport and the Environment of Southwest Finland informed about activities of the Finnish employment services for attracting foreign employees and integrating them into the local labour market. She stressed the importance of taking an action before problems arise. During the Workshop possibilities to cooperate with other similar projects implemented in the Baltic Sea region, such as Baltic Sea Labour Network (BSLN) and EXPAT were discussed. 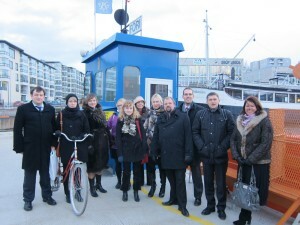 On November 27, 2012 the third “Centralbaltic Job Ferry” project Workshop organized by the Turku University of Applied Sciences (TUAS) took place in Turku, Finland. Project partners from Latvia, Estonia, Finland, Sweden and Germany, the Head of the Joint Technical Secretariat of the Central Baltic Interreg IVA Programme 2007-2013, as well as labour market experts from Employers’ organizations of Latvia and Estonia, Free Trade Union Confederation of Latvia, University of Stockholm, TUAS and the Centre for Economic Development, Transport and the Environment of Finland participated in this workshop. The Head of the Joint Technical Secretariat of the Central Baltic Interreg IVA Programme 2007-2013 Dr. Philipp Schwartzaddressing the Workshop participants emphasised the importance of cross-border labour market issues for promoting the sustainable economic development in the region, as well as recommended project partners to cooperate with other similar projects, such as the EXPAT project, being implemented in the Central Baltic region to achieve greater efficiency dealing with labour market issues through exchange of information and experience. The Deputy Director General of the Latvian Employers’ ConfederationMr. Eduards Filippovs informed about the BSLN project and a new regional platform dealing with the labour market issues established in the result of this project – the Baltic Sea Labour Forum, which has been recognized as the Flagman project in the EU Baltic Sea Region Strategy context. The Central Baltic Job Ferry project and its partner organizations received an invitation to join the Baltic Sea Labour Forum. During the Workshop Ms. Kirsi-Maria Nikander representing the Centre for Economic Development, Transport and the Environment of Southwest Finland provided the information on support programmes for attracting foreign labour force to the Southwest Finland being implemented by Finnish employment services. According to Ms. Nikander employment services of Finland are actively working to identify potential deficit of employees in certain professions before it could create any problems for employers or people in Finland. As one of successful examples in attracting foreign labour force she mentioned projects for attracting nurses from Latvia and Spain who were integrated into the Finnish labour market and currently works for hospitals of this country. Employment services of Finland are attaching great importance to issues of integrating foreign employees in daily routine of Finland, including searching for apartments, opening bank accounts, helping with schools and kindergartens for their children, etc., as well as language training which is crucial for finding employment in Finland. At the same time Ms. Nikander stressed that the integration of foreign workers in the Finnish labour market is complicated, time and resources consuming procedure, but this is very important to ensure that the labour market has enough workers. Participants of the Workshop discussed the use of the new Internet platform www.cbjobferry.eu for improving the cross-border labour mobility in the Central Baltic region. Proposals for adding supplementary information and features to make this platform more attractive and useful were discussed. Partners are considering possibilities to publish their best practice examples on the www.cbjobferry.eu, as well as information on practical issues which could help job seekers to find out more about living and working conditions, and responsible institutions in Central Baltic regions. This could be important for planning of advertising of job vacancies on the platform, as well as connecting it with other platforms providing information on trends in different labour markets, language training, as well as it would be useful additional information important for labour market participants. The new Internet portal offers information on the most demanded professions in the Central Baltic region, specific requirements for working in foreign country, legal and social regulations, level of salaries in certain professions, education opportunities, employer’s organizations, potential employers, etc. The data base of the most demanded professions offers an opportunity for users to select and compare detailed information by countries or regions and professions according to user’s requirements and interests, including qualification requirements, education level and other different criteria related to employment. This information could be useful for those who are searching for a job or education in particular profession abroad, as well as for employers looking for qualified workers in particular professions. The new Internet portal www.cbjobferry.eu is already available on-line. Its contents are still being actively complemented until at least 50 of the most demanded professions in each of the four Centralbaltic Job Ferry partner countries or regions will be filled in. The 4th Workshop and the Final Conference of the Centralbaltic Job Ferry project will be held on March 2013 at the University of Latvia in Riga. On 7th and 8th December 2012 „Centralbaltic Job Ferry” (CB Job Ferry) participated in the 4th Latvian National Employment and Professional Development Fair “Darbs EXPO 2012” (Job Expo) at the Kipsala International Exhibition Centre in Riga that provided information about the newest employment promotion measures, employment opportunities, the opportunities of vocational training or retraining. The highlights of year 2012 are opportunities of young people to enter the labour market and business. Latvian State Employment Agency, Representatives of EURES network as well as other institutions and companies participated in the event and introduced information about relevant vacancies, living and working conditions, social security and tax system in Switzerland, European Union and European Economic Area countries, as well as answered specific questions related to the labour market in Latvia and other countries. Participants of the fair “Darbs EXPO 2012” had an opportunity to receive CB Job Ferry brochure and information on the possibilities of Internet platform (www.cbjobferry.eu) developed during the project which is useful for job seekers, employers and labour marker experts. Transnational cooperation is seen as a key to reduce obstacles and enhance mobility across the borders in the Action Plan of the European Union Strategy for the Baltic Sea Region (EUSBSR) [The EUSBSR and its Action Plan is currently under revision. Although the wording might change, the authors expect “cross-border labour mobility” to remain an important topic and goal for the BSR]. Cooperation should take place on different administrative levels between municipalities, regions and Member States as well as between job agencies and other relevant control bodies through the exchange of experiences concerning support instruments and their efficient use.Recognition of qualifications is another important issue requiring cooperation between the control bodies across the entire region. The Action Plan especially addresses the importance of promoting links between labour training, retraining and advanced training with the actual labour market needs of the entire Baltic Sea Region (CEC, 2009). The Baltic Sea Labour Network (BSLN)project (2008-2011) addressed the issue of transnational cooperation regarding labour market questions by bringing together representatives from trade unions, employers, politicians, labour market experts, academics and public officials to work on cross-border labour mobility. The project aimed at providing a comprehensive picture of the Baltic labour market and its challenges by utilising research knowledge. It created a platform for decision-makers and facilitated the exchange of experience between them. A Baltic Sea Labour Forum was established for continuous transnational cooperation of labour market actors:www.bslabour.net. The CentralBaltic Job Ferry project (2011-2013) is another example for creating a forum not only to facilitate transnational cooperation but also enable labour mobility. By focusing on the Central Baltic region, the project involves labour market experts and facilitates the exchange of experiences concerning cross-border mobility between them. The online platform – as concrete tool based on the transnational cooperation efforts – provides information e.g. on the most demanded professions in the region, recognition of qualifications and labour market regulations in Latvia, Estonia, Finland and Sweden. The platform includes information for job and education seekers as well as for employers or authorities involved in recruitment or administration. The platform will stay online even after the end of the project: www.cbjobferry.eu. CEC (Commission of the European Communities) (2009), European Union Strategy for the Baltic Sea Region – Action Plan, SEC (2009) 712/2, January 2012. The analysis carried out in the framework of the “Central Baltic Job Ferry” (CB Job Ferry) project concludes that there are still many challenges related to cross-border mobility and working patterns in Estonia. In addition to many well-known obstacles also discussed in earlier studies, our analysis points out a level of cautiousness and prejudice related to cross-border working as one of the most problematic issues. The currently ambivalent attitudes in the society and lack of a long-term national strategy do not provide a conductive ground for unlocking the real potential in a cross-border Central Baltic labour market. In terms of problems related to cross-border mobility in Estonia, in 2009 “The Scientific Report on the Mobility of Cross- Border Workers within the EU-27/EEA/EFTA” by MKW Wirtschaftsforschung GmbH outlined language barriers and infrastructural problems as main obstacles. The expert interviews carried out during the research phase of CB Job Ferry project confirm that the nature of barriers has not changed dramatically by 2012. Language skills still clearly remain a barrier for both incoming and outgoing mobile workers in Estonia. Althoughtransportation linkages do not constitute a major problem in the case of Finnish-Estonian border region, the connections between Latvia and Estonia could be better. In addition to these aspects, the 19 expert interviews carried out in the framework of the Central Baltic Job Ferry contribute to a more detailed overview and additional insights related to the range of the problems. (1) Getting necessary information in a user-friendly way – while a lot of information is available, it is difficult to get a well-structured, practical step-by-step overview related to various things that need to be done when starting employment abroad. (2) While the situation with employees´ rights is undoubtedly better than it used to be 15 years ago, problems in this area are not uncommon. (3) Family issues. The mobile worker´s family often stays in the home country and long-distance relationships are inevitably difficult. If the family-members also commute, they often face administrative difficulties, problems related to fitting in, etc. (4) Problems related to potential reintegration to the local (home) labour market when returning(weakened contacts and tacit knowledge). (1) Estonian employers (and the society in general) are still not very open towards foreigners. The commonly held view is that it is somewhat more difficult to deal with foreign workers compared to Estonians as ‘you don´t always know what to expect from them’. (2) Ambivalent attitudes towards work-related mobility also exist in the society at large and there is no long-term national strategy on the development of cross-border labour markets. This clearly creates challenges for mobile workers in Estonia. The interviews revealed or reflected on a perception that cross-border mobility is seen as ‘giving the finger to the devil’ – it is believed that people only start this way and actually end up emigrating after some time. While EURES network is doing a very good job in Estonia, there are a lot of mixed feelings related to their work which is sometimes seen as counterproductive to the government´s goal of keeping the Estonian talents and skilled workers in Estonia. To deal with the challenges, first and foremost it is important to develop a better understanding of the dynamics of cross-border mobility in Estonia, including both dangers and opportunities. This is a precondition for channelling the future developments in a favourable way on both national and regional levels as well as on cross-regional/international level. Once the national government and municipalities have a better ‘big picture’ view, they can also plan incentives and corrective actions to minimize potential negative effects. This would also help employers and employees to become both more open to cross-border work as well as more aware of the risks. As smaller-scale specific measures, more easily accessible low-cost Estonian language courses and user-friendly, practical online (information) services can significantly facilitate cross-border mobility in Estonia. The analysis was based on literature review, data analysis and expert interviews conducted with regional and national level labour market actors in 2012. The country-specific analysis was carried out as an input to the comprehensive study on the situation of cross-border labour market in Estonia, Finland, Latvia and Sweden. The final versions of the country-based reports and the synthesis report, developed by Nordregio (Sweden), will be available in spring 2013. Please, let us know if you are interested in receiving news and information on labour market mobility also in the future by contacting us! Project coordinator, Zane Zeibote, is a researcher at the University of Latvia Centre for European and Transition Studies.